Want the biggest iPod in the world? Ask this small gadget shop, which specializes in going where Apple won't. Rapid Repair retrofits old iPods with 240GB hard drives. (Fortune Small Business) -- Like many consumers, John Mayberry was looking to upgrade his iPod. The IT technician had 50,000 songs stored on his computer, but his 60-gigabyte iPod maxed out at 12,000 songs. And Apple (AAPL, Fortune 500) wasn't helping. Last year the company discontinued its largest iPod, a 160GB model, citing concerns about its design. Currently the largest iPod that Mayberry can buy is 120GB - or half the size of his music library. That was the cue for Rapid Repair, located in Kalamazoo. In February the startup began retrofitting old iPods with a new 240GB hard drive. The price of the procedure, $300, was the same as the cost of a new iPod, and having the device hacked broke its warranty. But Mayberry didn't care: He finally had an MP3 player equal to his music library. "I'll hold on to this one for a while," he says. He wasn't alone. In the first two hours the service was available, Rapid Repair received 300 orders - more than its inventory could handle. One month later the company had solved its supply problem and upgraded 500 iPods. 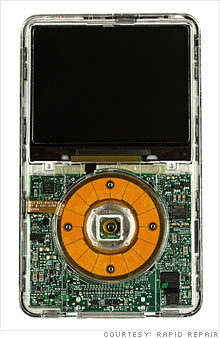 The 1.8-inch hard drives, made by Toshiba, are of roughly the same dimensions as regular iPod hard drives. Rapid Repair clears around 25% profit on each installation. Thanks to swift advances in storage technology, the company appears to have tapped into a market for expanded iPods that the computer giant isn't serving. "You couldn't have made this business happen 10 years ago," says CEO Aaron Vronko, 26. In 2007, Vronko launched Rapid Repair with a business school classmate, Ben Levy. Both technophiles, they shared an aptitude for fixing broken cell phones and MP3 players. A business model was born: By 2008 the company had 15 employees and was repairing some 500 gadgets a week, mostly via online orders. Revenues totaled $3 million last year. By this summer, Rapid Repair hopes to offer the same upgrade service for Microsoft's Zune and other MP3 players. The company's new focus on upgrades involved a major shift in strategy. "People don't upgrade because their devices are a little beat up," says Dale Ford, an analyst with iSuppli, a research firm based in El Segundo, Calif. "It's more because they think, 'Wow, look at what these new devices can do.'"